Thanks to last summer’s home renovation project, the new kitchen is lit by six interior flood bulbs. We were using the diffuse incandescent bulbs our contractors put in, which were nice and warm and soft. And also, being essentially freebies, not long for this world. We recently had three burn out within two weeks. We decided to take the opportunity to switch from incandescents to something far more energy-efficient. Having used a number of CFLs around the house, I knew I wanted no part of that scene. The subtle flicker they generate isn’t subtle enough for me, and I hate the wan quality of the light. I’m not really thrilled with the warm-up time, either. So we went with LEDs. This wasn’t as straightforward as I might have liked, but we’ve now switched and are really happy to have done so. I’d like to share the most important thing we learned in hopes of helping others through the transition. It’s this: if you’re going from “warm” incandescents straight to LED, find bulbs that have a color temperature of 2700K. The first test bulb we bought was 3000K, and the difference was enormous. By comparison to the incandescents, it was a harsh white. In a Modernist design setting, like say at the Guggenheim, 3000K is probably a good choice. In our wood-and-grain center-hall Colonial home, it was all wrong. So I ran up to Home Depot and picked up a couple of EcoSmart BR30 diffuse floodlight bulbs, which are 2700K. I put in one as a test, and when we flipped on the lights, I couldn’t see a difference in the light given off by the LED and incandescent bulbs. The LED gave off a little bit more light than the incandescents around it (more on that in a minute) but the quality of light was essentially the same. I put in the other test bulb with the same results. Now we have all six cans fitted with the EcoSmarts, and the kitchen is just as warm as it was before. One slightly noticeable difference is that there are more lumens bouncing around the kitchen than before, because we had 65W incandescents and the LEDs are equivalent to 75W (they actually consume 14W). There weren’t any 65W equivalents in the floods, at least when I went looking, so I picked the 75W equivalents. The new bulbs put out 800 lumens each, whereas the old ones likely shed 650-700 lumens each. I do notice the difference, but it’s not so extra-bright that it’s bothersome. That said, if I track down some bright white 2700Ks in the 650-700 lumen range, I may swap out half the kitchen bulbs in a staggered pattern to see how it feels. Whichever ones I don’t use in the kitchen, I can always reuse in the cans in our basement. The really noticeable difference is that when you flip the wall switch, it takes half a second for the bulbs to actually light up. It’s a bit unusual when you switch straight from incandescent, but it’s no worse than the “on time” for most CFLs, and there’s no slow warm-up time for LEDs like you get with CFLs. Once they’re on, they’re on. And they don’t hum or flicker they way CFLs are prone to doing. In closing, I just want to reiterate that color temperature is absolutely crucial, and if you’re coming over from incandescents, you want to be at 2700K. Beyond that, match up the wattage as best you can, grit your teeth through the purchase price, and bask in the knowledge that your electricity bills will be lower, plus you shouldn’t have to replace the bulb any time in the next decade or even two. That last part alone nearly makes LEDs worth the up-front cost. If you have experiences or tips to share with regards to LED bulbs, by all means leave a comment! Keep your receipts and the part of the packaging that lists the 5 year warranty. 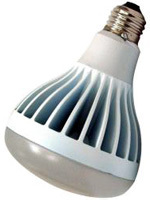 I bought the Ecosmart PAR30 bulbs for my kitchen can lights and had one bulb quit working. I called the warranty number, they told me to take it back to Home Depot, and they replaced the bulb, no charge. You can go to a theatrical supply store or a grip rental house and buy colored gels, warming. CTO, 1/2 CTO, 1/4 CTO etc. Or something close to a Wratten 81, 81A, 81B 85, 85=C etc. They are all amber in color. You can cut these with scissors and put them into the fixtures so the light shines through. This will remove the blue cast but will not add the missing part of the color spectrum. Your next best choice will be a “Full Spectrum” LED lamp. I do not know if they are made as yet. It took years before someone discovered how to make them in fluorescents and that will bring you to 5000-5500 degrees Kelvin, which is close to daylight. Then you would use a full CTO gel (filter) to get it to 3200 K. This way you will get the color temp you are looking for but still have (most) of the full color spectrum which will get you very close to the real color you want without looking ghoulish. When I moved into this apartment five years ago, I went to the store and bought CFLs for every indoor fixture and lamp. It CAN be hard to find the lower-color-temp bulbs, regardless of which tech you’re using. Meanwhile, I’ve yet to replace any of those bulbs, and I abuse three in particular – one is on 24/7, two others are cycled several times a day. Thanks for this post. I am eager to replace my centered line 3-pot kitchen light fixture with something that is positioned better since most of the work space becomes shadowed by the person attempting to use it, but I can’t tolerate CFLs and am waiting for LED prices to hurt less. Thanks for the post. I’ve been holding off on CFLs for our lights in the kitchen like this. These sound like a much better approach. Time to hit up Lowes. Interestingly, some of the longest lasting bulbs we have had are the original freebies from the builder. The final bulb finally gave it up after 6 years of use…after other lights had gone through multiple generations. Crazy. Nothing really to add, just a thanks. I have been trying and experimenting with a few of the flood lights in the house, I had been holding off on LED lights due to the price tag on them. I have spent hours standing in Lowes reading the back of the box and surfing the web on my phone only to walk out with another CFL. I got 2 more I need to replace so going to give it a go with LED. Thanks again for another extremely useful post. The lower color temperatures are more difficult to make. The market is being flooded right now with cheap LEDs from the Pacific Rim, including China. I understand the better LEDs are being made in the US. Look for Cree (Raleigh, NC) or Phillips Lumileds (CA, originally an HP spinoff). I have noticed the Cree name on a lot of packages lately, probably to dissociate themselves from the cheaper Asian competition. I have been using an LED lamp over my desk for several months. It seems to generate more heat than an incandescent bulb. I suppose that future homes will require a separate low voltage system to fully utilize LEDs without wasting power generating heat. Echoing the comment about hanging onto proofs of purchase for LED lighting. I has a Philips LED light go out after 3 weeks of use. They provided a postage-paid label for return and then sent me a check for the full retail price. The phone rep said they wanted failed bulbs back so they can test them. Next entry: The Web Ahead, Episode #18: Me!